This chandelier is absolutely beautiful. It fits in my old 1938 home perfectly. The light shines and shimmers when it is on, the reflection on my walls is so beautiful. A little tedious to put all the crystals on, but they are true crystals not plastic. A really well made product. Bring a touch of glamour and elegance to your home with the Kosas Home Manson Chandelier. 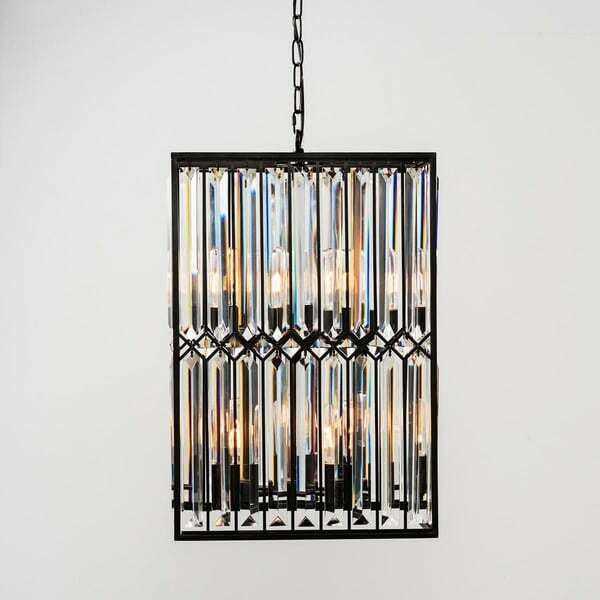 The combination of gleaming crystal and industrial iron are perfect for any space or décor. The box shape allows multi-dimensional lighting and eight bulbs provide plenty of shimmer to illuminate your space. Professional installation is highly recommended. To clean dust lightly with a feather duster or clean dry cloth. Dimensions 13.0 In. X 13.0 In. X 22.0 In. This light is absolutely gorgeous! The crystals reflect beautifully over the walls. The crystals are glass, whereas other brands I looked at were acrylic. Easy to assemble. Would buy this again, it makes me that happy! This is a beautiful piece of hanging art. It arrived quickly and well packaged. This fixture would be great in a foyer, or some other open space where it can be appreciated as the showstopper that it is. 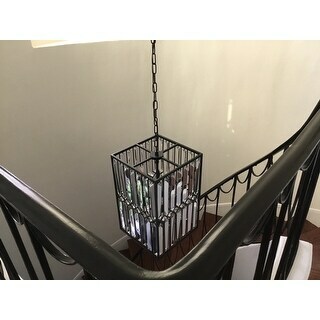 "The Details describe dimensions for a canopy and pendent for this light fixture which do not add up to the Specs Dimensions of 13 inches wide x 13 inches deep x 22 inches high. Which one is correct?" The measurements are correct. The overall measurements of the light fixture are the 13 inches wide x 13 inches deep x 22 inches high.